a) Full 32bit design,and made sure the precision of 32bit via USB input.The maximum sampling rate is up to 384kHz,and supports DSD input,DSD64 and DSD128.Using two most advanced 32bit DAC chip ESS9018S. b) Newly developed high stability heavyweight chassis vibration to eliminate the vast majority of interference.Elegant layout and structure to prevent leakage magnetic interference.The machine has analog, digital, dual- R type transformer for power supply. 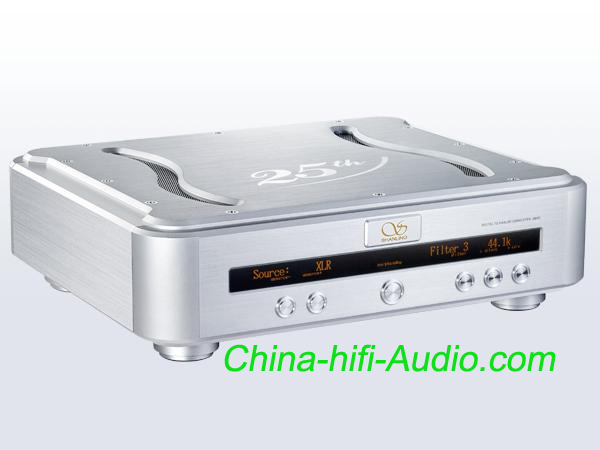 c) High standards of audio design and uses a lot of audio devices.The machine adopts ultra-low JITTER design,with built-in PLL,and with clock synchronization, as well as clock output function.You can use 1PPM TCXO and CD turntable to form an audio system of non-JITTER. d) The clock uses two regulators to ensure extremely low phase noise.Ultra high standard power supply design,as many as seven groups of LDO for power supply of ESS9018S. e) Bluetooth input, support HIFI level APT-X format ; asynchronous upsampling fuction,provide users with high-density sound experience.Two digital filter mode selection to suit different types of music playback.The unbalanced output circuit consists of tube 6H30 and with whole visual,multi- OLED display.